Laminating is a quick and easy way to protect your documents and enhance their quality. By adding a plastic coating to paper or card, a document becomes more durable with a quality, professional-looking finish. Our laminating machines are user-friendly with outstanding reliability, we are proud to say that only our laminators are 100% jam free when used with Fellowes® laminating pouches to ensure you get perfect results every time. Click here to see our laminators in action. It’s important that you select the right machine to suit your lamination needs. Fellowes® laminators are segmented on; how often they are used and the thickness and size of laminating pouch they accept. The thicker the pouches accepted, the more versatile the machine and the more applications for which it can be used. • Where and how often will the laminator be used? • What size and thickness laminating pouches will you need to laminate? • Which unique Fellowes® laminator features will make laminating easier? 1. Where and how often will the laminator be used? The Fellowes® range has been developed with all types of users in mind. Whether you need a simple solution for occasional use in the home, or a laminating machine that is built for daily use in a large office environment; there’s bound to be a machine in the Fellowes range that is ideal for you or your business. 2. What size and thickness laminating pouches will you need to laminate? Fellowes® offer A4 and A3 laminators - the wider the entry the more flexibility there is to laminate different sized documents. It’s always worth considering a laminator that will accept pouches bigger than you think you will need; that way you’ll always be able to laminate documents from ID size right up to as big as A3. Laminating pouches come in different sizes and thicknesses. To learn more about choosing the right laminating pouch click here. Fellowes® laminators cover pouch thicknesses between 80 and 250 microns. The thicker the pouches accepted, the more versatile the machine. 3. 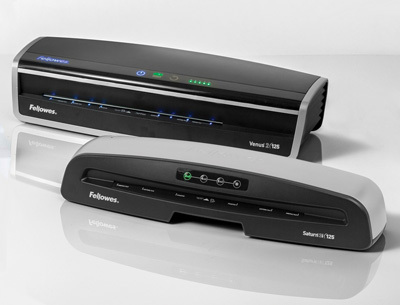 Which unique Fellowes® laminator features will make laminating easier? Now you have an idea what machine may best suit your needs, it’s worth considering the features unique to Fellowes® that will make laminating simple, easy and quick. With high performance, innovative features and award winning designs, Fellowes® laminators take user-friendliness to a new level. Look out for the following unique Fellowes® innovation. When it comes to laminating the possibilities are endless! Be sure to visit our laminating Ideas Centre to get inspired!